A personal view of the birth of a product and brand. In 2013 I moved to Oxford having spent the previous five years in the wilderness of rural Normandy, France (long story …). Getting back into a busy urban city environment was a well-needed jolt back into the 21st century and the start of a rekindled passion for two-wheeled transport. Oxford is one of Europe’s great cycling cities where it is estimated that upwards of 20,000 journeys are made by bicycle every day. This has several major beneficial effects as it clearly reduces the amount of cars and congestion on the road, lessens the pressure on public transport and keeps people fit; however having so many cycles on the road in a busy city does bring its own particular problems. Not least of these problems is the impact on pavements of parking bikes against walls with the handlebars sticking out some 18 inches (45cm) causing a considerable problem for pedestrians, people with children in pushchairs and wheelchair users being more obvious examples. At the time I was then living in one of the narrow terraced backstreets of Oxford’s inner city Jericho neighbourhood and it was this issue in particular that got me thinking about the problem and after having several (locked) bikes stolen from the pavement right outside our house I took to bringing the family’s bikes into and through the house every evening to safely store in the backyard overnight. 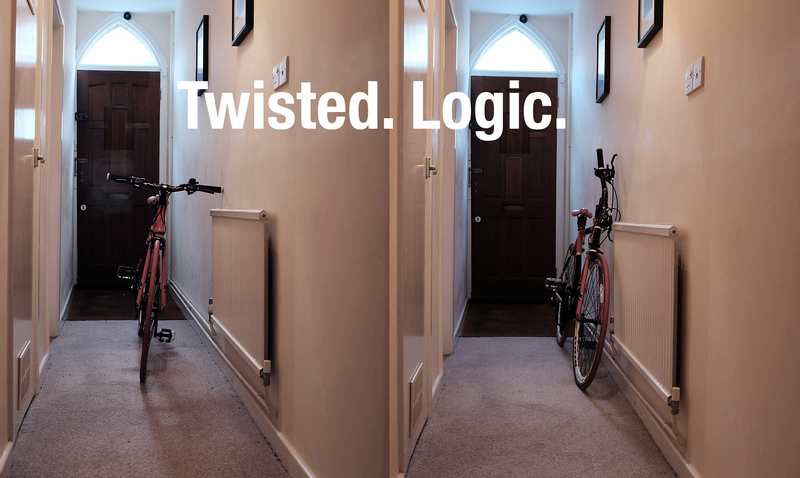 Manoeuvring a bike through a hallway, which in the average city house or apartment is barely wider than the handlebars, every night, was a challenge and inconvenience that I could have done without. And so it struck me that this was simply a different manifestation of the problem of parking a bike on the pavement. It should go without saying that handlebars are rather essential on a bike and cycling without them is not to be recommended, however when it comes to parking, storage and general handling they quite simply become a pain in the ****. A bike is simply too wide when you are not riding it. Fact. It takes up a disproportionate cubic chunk of space in relation to its otherwise spindly proportions. A quick Google around the globe showed that absolutely no-one had managed to solve this problem successfully and there existed no product commercially available anywhere in the world that fitted the criteria of the design brief formulating in my head. Some smart design thinking was needed. After many days, weeks, months of constantly thinking, scribbling and writing in my notebooks I finally hit upon something that I thought had promise. And so a succession of ‘kitchen tabletop’ prototypes followed using such unlikely materials as broomsticks and plastic plumbing materials bought from the local DIY store and cobbled together in the kitchen of our small terraced home. Eventually I was convinced I had found a solution that worked but lacked the detailed engineering expertise to take the idea any further. It was at this point that I embarked upon a string of unsuccessful meetings with some very well known cycle brands and manufacturers (you know who you are) to try and find a partner to bring the newly named Quicktwist™ handlebar stem to market. Although discouraging at the time, with hindsight this was probably the best thing that could have happened. 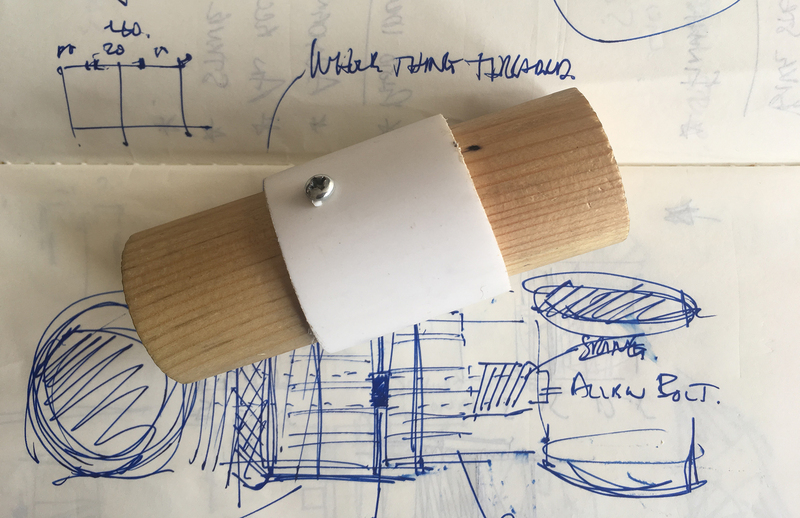 In the meantime I had taken the sensible step of registering the design for patent and was then by chance introduced to a brilliant design engineer with a Williams Formula One background, Adrian Ward. We hit it off immediately and Adrian totally understood the whole idea of the product. 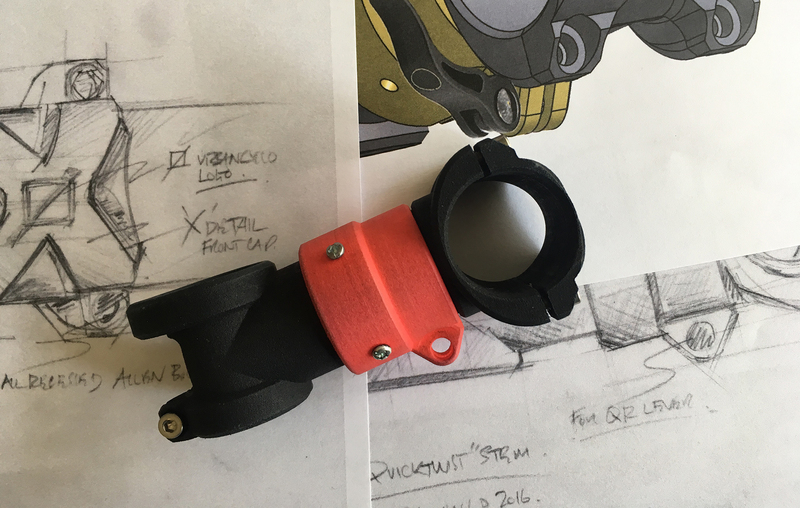 He took my original designs and over a period of time we fine-tuned the CAD drawings into the final pre-production 3D printed prototypes that we have today. It was shortly after this that it was clear a key third member of the team was desperately needed to work alongside myself to head up the business and marketing functions which will be so essential for the success of the brand. I had many meetings with prospective candidates but finally Ed Williamson found us via an ad on a free local website. Ed has considerable experience in business and marketing gained in publishing in Oxford and now completes the core of Team Urbancyclo. We now find ourselves at this most pivotal of points in our journey, to raise the funding for the first production run of Quicktwist™ stems. We have had many offers from investors wanting to ‘buy into’ the brand but have chosen to retain full control and fund it ourselves via a 45 day Kickstarter crowdfunding campaign. 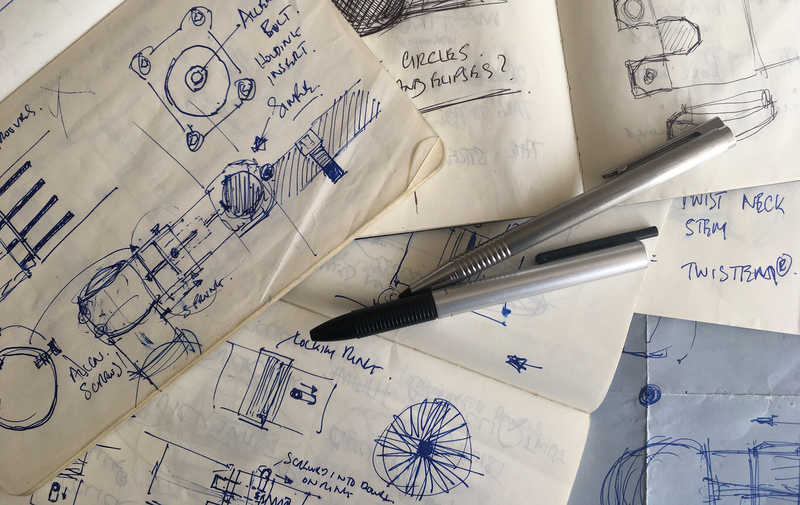 And so here we are today on the verge, we believe, of launching what will be one of the most radical and innovative bike products to hit the cycle market in a very long time. Ultimately one that will change the way we use our bikes in towns and cities, change the way we park and store our cycles and increase security by making it easy to take them off the streets at night. Facilitating easier parking in busy public places, making it possible to get more bikes into less space at train stations and other transport hubs. Please join us on this journey by supporting our Kickstarter campaign and grab yourself a bargain and a bit of cycling history. Andy Bullock – founder/designer, Urbancyclo, Oxford, UK.